Jorianne loves to receive feedback about her readings, and to hear how her predictions have come to pass. “It helps me gauge my accuracy level,” she says. Remember, some things take longer to manifest than others. 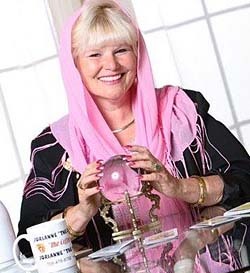 Jorianne has received feedback anywhere from one hour up to fifteen years after a reading. Contact Jorianne today to schedule your personal reading, or to book Jorianne for your house party, corporate event, or media or public appearance! Readings can be done in person, over the phone, or via Skype. Call Jorianne at: 219-940-9292 -- THIS IS THE easiest and fastest way to contact Jorianne! Copyright 2000 CoffeePsychic.com. All Rights Reserved.